Browns are native to Europe, North Africa, and western Asia. This species was introduced into North America in 1883. 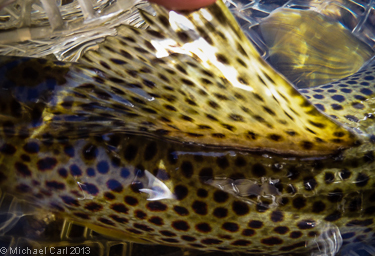 In 1893, brown trout embryos were brought to California and successfully reared fro planting in coastal streams. Since that time brown trout from various sources have been raised in California hatcheries and planted throughout the state. 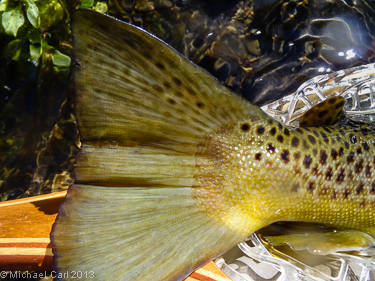 Brown trout are now present in a high percentage of coldwater fisheries, especially on both sides of the Sierra Nevada. 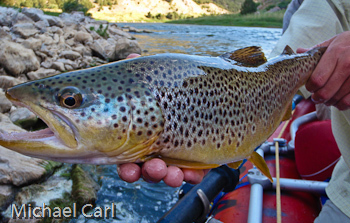 Brown trout are the only trout in California with both red and black spots on their bodies. Black spots tend to be larger and present on the gill covers, tail, head, adipose fin, dorsal fin, and sides. Red spots are present only the lower sides. Adults are usually dark to olive brown on the back, shading to yellow brown on the sides, and white to yellow on the belly.